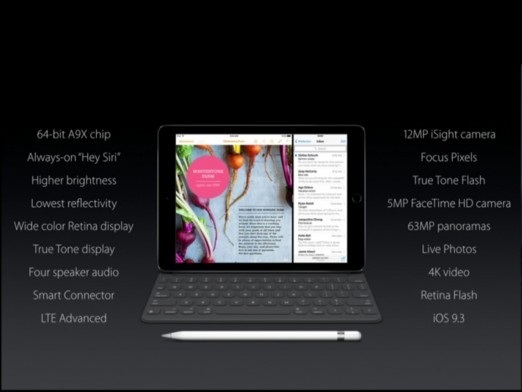 Apple has just announced a new iPad Pro, a smaller version of its iPad Pro tablet released last year. The new iPad Pro has a 9.7-inch display and weighs less than one pound. The new Pro is the same size as the iPad Air 2. The display on the new iPad Pro is said to be 40 percent less reflective than the iPad Air 2’s screen, and Apple claims that it has the lowest reflectivity of any tablet screen. Apple also claims that the 9.7-inch display is the brightest tablet screen on the market. It also features a new technology called “True Tone Display”, which measures the color temperature of ambient light and adjusts the display to match. The Pro also takes advantage of iOS 9.3’s new blue-light reduction feature for late-night use. Powered by the A9X processor and has a similar four-speaker system. Apple says it’s twice as loud as the Air 2. The new tablet is compatible with the Pencil stylus introduced last year. Other accessories include a new Lightning-powered SD card reader and USB camera adapter. New iPad Pro steps up to a 12-megapixel rear camera, complete with focus pixels, dual-tone flash, and Live Photos. For selfies, the Pro offers the screen flash introduced on the iPhone last year. The new iPad Pro will be available in four colors — space grey, silver, gold, and rose gold — The 32GB model will cost $599, while a 128GB version will be available for $749 and the 256GB top of the line for $899. All of those prices are for Wi-Fi-only models; LTE options generally cost $130 more. Apple says preorders will start on March 24th, with availability set for March 31st. Next articleFree Office 365 Personal and 1TB of OneDrive for 1 year!